Flashy $300 on-ear headphones with BIG 50mm drivers. That "X Factor" branding? Yup, it's from the horrible American Idol ripoff TV show. Someone who's desperate to call attention to themselves and their eminently good taste. Sony X Headphones have a brawny plastic and metal build that's surprisingly lightweight. Shiny, shiny earcups over luxurious, pillowy pads. The headphones fold up into a compact package, and the replaceable, flat cable is wonderfully tangleproof. The big, puffy headphones are crazy comfortable—you can wear them all day—but they'll make your ears sweat. Despite the terrible music on The X Factor, Sony X Headphones sound outstanding. 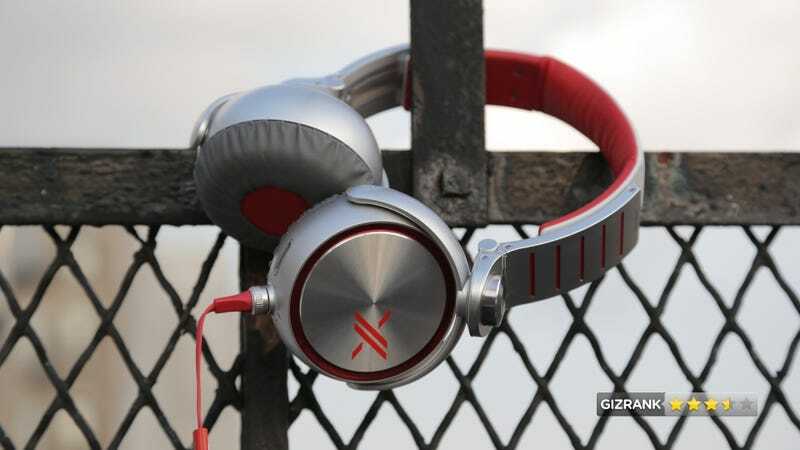 They're the bassy headphones that are in vogue these days, but the bass is dialed back a touch so it doesn't kill the richness and detail at other frequencies. When you're walking down the street, you feel like Simon Cowell urinated all over your head. Why oh why do these otherwise good headphones have to be endorsed by a stupid television program? Why can't Sony rely on the quality of its engineering to sell its products? The X logo on the earcups looks like a "does not equal" sign. Does not compute. Tested over two weeks at our desks in the office and also on the street and the subway. Listened to mostly Spotify, but also listened to some lossless CD rips as well. These are near perfect desk headphones. Unlike other on-ear headphones, they won't pinch your head after a few hours of use. They block out unwanted environmental noise without noise-canceling electronics. That said, we'd hesitate to wear these cans out on the street. Sure, sure they're comfortable, durable, and very well-designed. But who wants to wear a bad TV advertisement on their head? We don't. We won't. Sigh, no. There's nothing wrong with them except for the horrible branding and the $300 price tag, but you can get equally good cans for less money. Check out the Harmon Kardon CLs for something cheaper and better. Make this purchase if you don't mind paying a bit too much, and you really just want to support Simon Cowell.